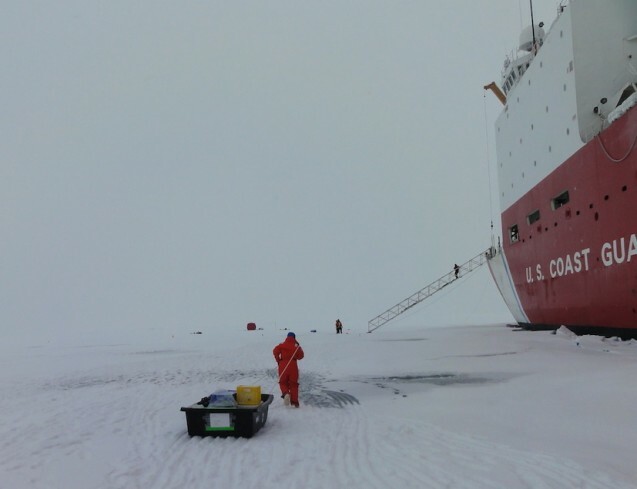 The U.S. GEOTRACES program launches into the Arctic Ocean as part of a multi-nation, multiple ice-breaker effort to study marine trace elements. Trace elements play two opposing roles in the ocean, as both essential nutrients (iron, zinc, cobalt) and as toxins (arsenic, copper) affecting biologic productivity and carbon cycling. Studying these elements in the Arctic marine system can help us understand the biogeochemical responses to rapid climate change. 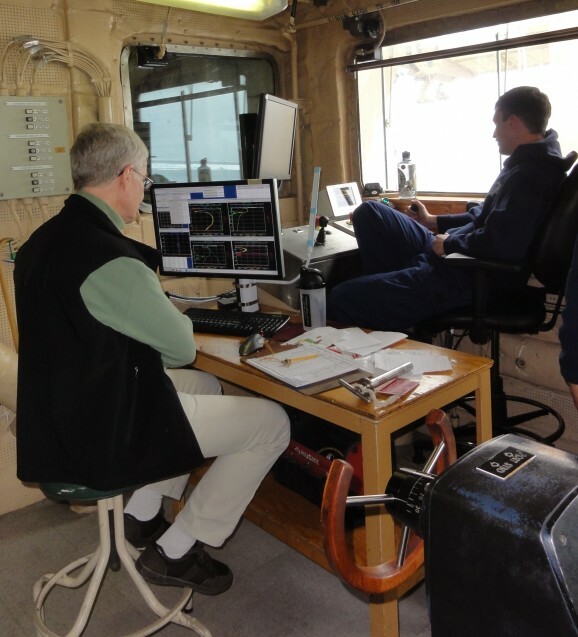 Lamont-Doherty geochemist Tim Kenna is on the U.S. team, aboard the USCG Cutter Healy research icebreaker. 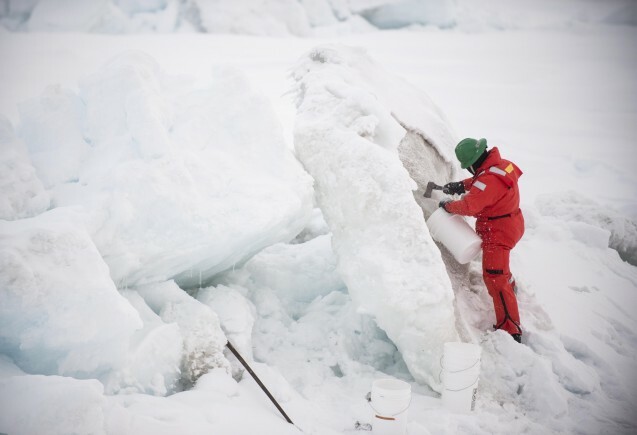 Completing an “Ice Station” means collecting samples over a wide range of Arctic water and ice conditions. Each station means a major orchestration of people and resources. The teams gather, equipment is assembled, and the trek off the ship begins. 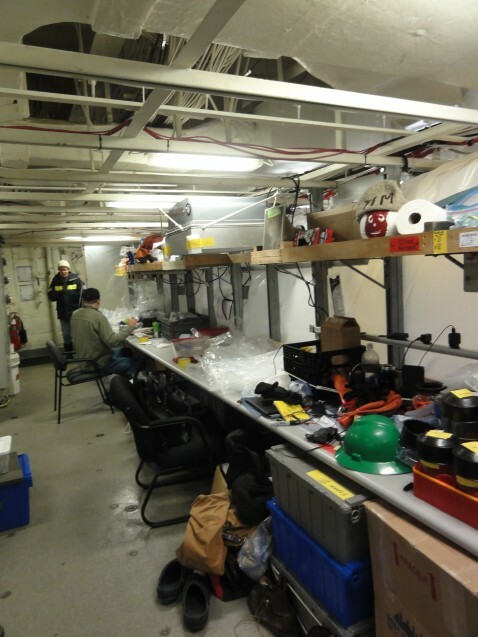 After the first off-ship exodus, the sample teams are well practiced in moving equipment and setting up work areas so as not to interfere with the other stations. There is no shortage of space so spreading out is not a challenge! 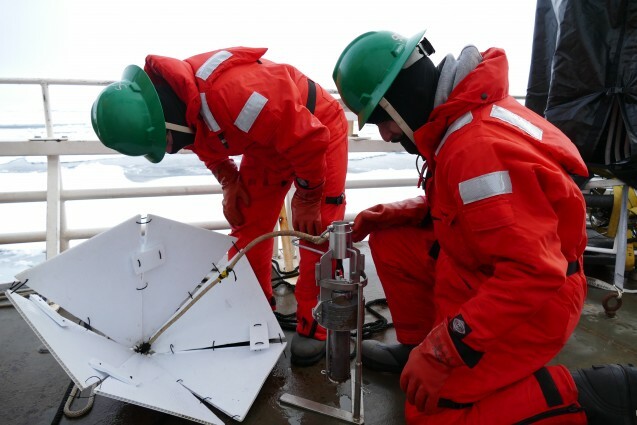 Collecting a wide range of samples at multiple Arctic locations allows GEOTRACES to get an integrated look at the trace elements moving through the Arctic ocean ecosystem, and to better understand how these elements connect to the larger global ocean. Each is carefully collected. Whether the elements are “contaminants” or essential nutrients, there is a specific protocol in order to quantify the inputs without “dirtying” the sample. It may seem odd to think of “dirtying” something we label a contaminant, but in order to fully understand the concentrations and methods of transport for each element, every sample is handled with the same amount of care. The following photo essay showcases the various ice/water sampling stations and reviews what is being collected at each. 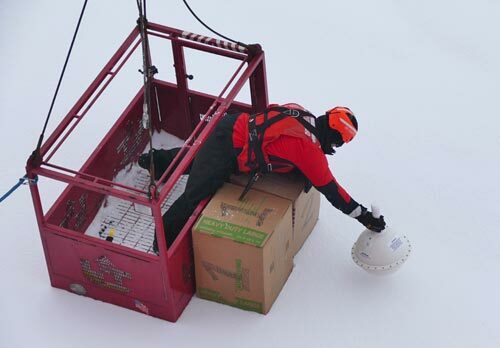 Snow samples: The snow collected at this station is being used in part to determine the presence/absence of contamination related to the March 11, 2011, Fukushima event. 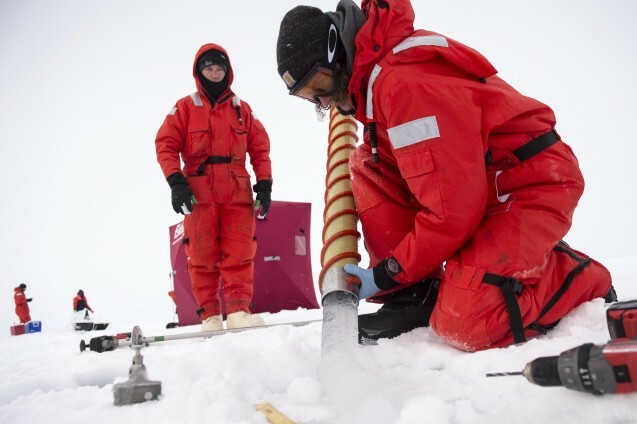 Both the snow samples and the ice core sections will be analyzed and examined along with the information collected from seawater, suspended particulates and bottom sediments, in order to better understand the influence of processes specific to the Arctic on the transport and distribution of several anthropogenic radionuclides. Ice core samples: The ice cores are sections of sea ice, and again are being collected to determine the presence/absence of contamination related to Fukushima. 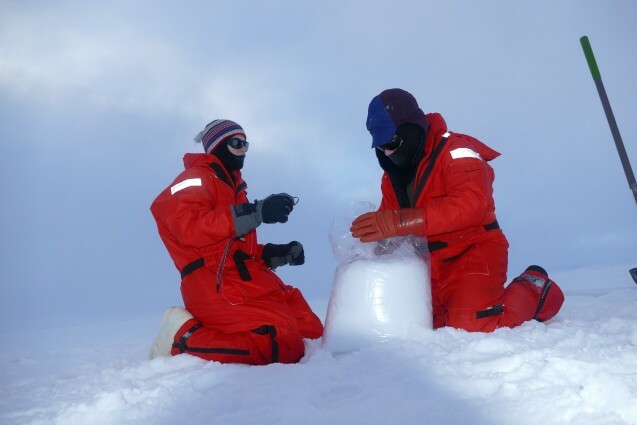 In general the samplers were able to obtain 1.5 to 2 meters of ice in the cores. Melt ponds: Surface melt ponds form on the sea ice in the long days of the Arctic summer. The warmth of the sun creates ponds that sit on top of the ice. The water collected in these ponds carries different properties than either the sea ice from which it melted, or the ocean water from which the sea ice formed. Most often these ponds have a frozen surface layer that needs to be drilled through before water is pumped out for collection. Beryllium-7 (7Be) samples: Produced in the atmosphere when cosmic rays collide with nitrogen atoms, 7Be is constantly being added to the surface of the water, and therefore is a great surface water tracer. With its very short half-life, ~ 53 days, 7Be can be used to track water parcel circulation as it moves between surface and deep water (which has no significant source of the 7Be isotope). The surface water pulls the 7Be with it as it moves down deeper into the ocean, allowing us to track and time the mixing process. Dirty ice samples: The dirty ice work is more opportunistic, and therefore is not part of each ice station. 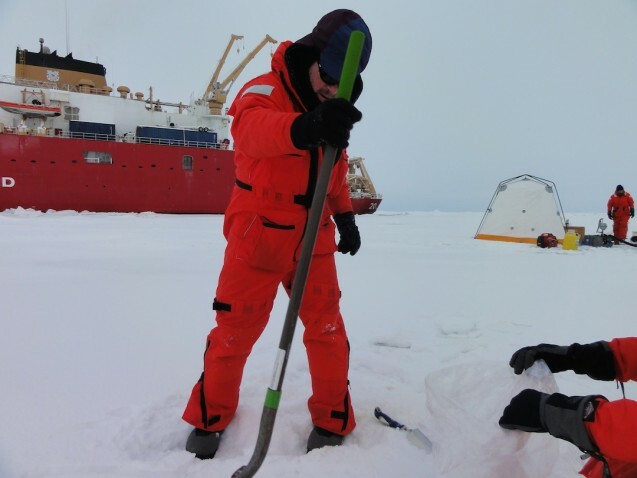 If dirty ice is spotted, it will be sampled, and while it may not be part of each ice station, it is part of the overall GEOTRACES protocol. While most of the stations sample for quantification, i.e. grams of sediment/ml ice, the dirty ice samples are used more for characterization, i.e. composition or mineralogy. For Tim’s work the collection of dirty ice is used to look at sediments originating from continental shelves bordering the Arctic, with the goal of evaluating or characterizing dirty ice as a transport vector for anthropogenic radionuclides. Minimal processing of the samples collected at the stations will occur on the Healy. The snow and ice gets melted and the seawater acidified. The focus of the trip is to collect as much material as possible. There will be plenty of time for processing when the researchers are back at their home institutions. 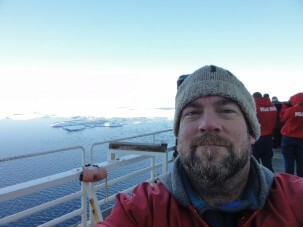 Margie Turrin is blogging for Tim Kenna, who is reporting from the field as part of the Arctic GEOTRACES, a National Science Foundation-funded project. For more on the GEOTRACES program, visit the website here. 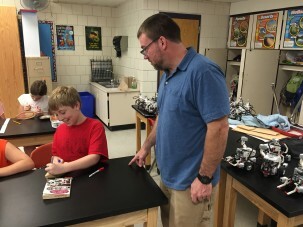 Geoscientist Tim Kenna works with his son’s fifth grade class to decorate boats for the “Float Your Boat” project. Jack Kenna works to get his boat ready for an Arctic deployment. In preparation for their Arctic work, GEOTRACES linked with “Float Your Boat,” an education program with a unique concept. Float Your Boat blends the themes of historic Arctic drift studies, modern GPS technology and hands-on science to engage local communities with work in remote science locations. Scientists currently aboard the research vessel Healy spent time last spring recruiting and meeting with school groups to share information about the Arctic, their upcoming science cruise and collecting small student-decorated wooden boats that would become part of the project. For over a month, the science team has been anticipating the deployment of these small wooden vessels since this builds a direct connection to their families and communities back home. The student boats are deployed in a 100 percent biodegradable box lowered carefully onto an iceberg along with an iridium satellite tracking buoy. The tracker is activated, “calling home” so that it can be used to track the circulation of the ice. Over time the ice is expected to melt and the box will biodegrade, sending these small floating wooden boats into the high seas of the Arctic Ocean. 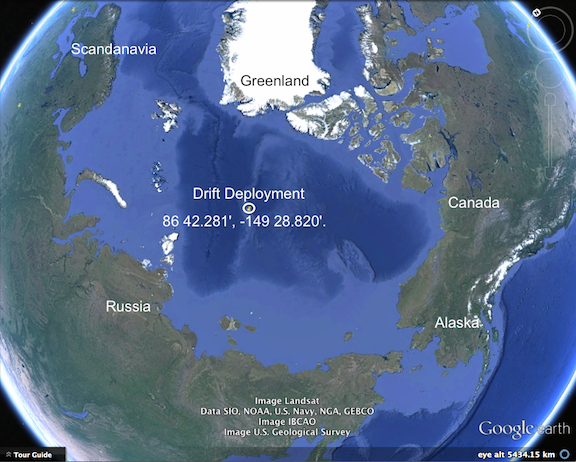 The location of the Arctic drift boats was close to the North Pole. In many earlier years this area would have been inaccessible for a ship to penetrate to set up this drifter experiment. 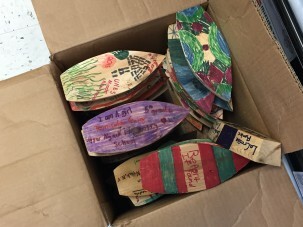 Once the box degrades, the boats will be separated from the tracker, but each boat has been identified by the students with their school and their own name and stamped with the project contact information. If any of the boats wash up onshore, there is enough information for the locator to contact Float Your Boat with a date and location. Through online tracking of the iridium satellite, this project provides opportunities for students to learn about Arctic change, marine circulation, marine debris transit and maritime careers. The Float Your Boat project concept comes from early Arctic science, when drifting ice floes were used to track Arctic circulation. In the International Geophysical Year (1957-58), Lamont scientist Ken Hunkins resided for two six-month stints on Ice Station Alpha, a station built on top of the Arctic sea ice. Science teams were flown in by plane and dropped, along with their equipment, about 500 miles north of Alaska. There they studied a range of ocean parameters, including tracking their own progress as they moved along with the ice drift. 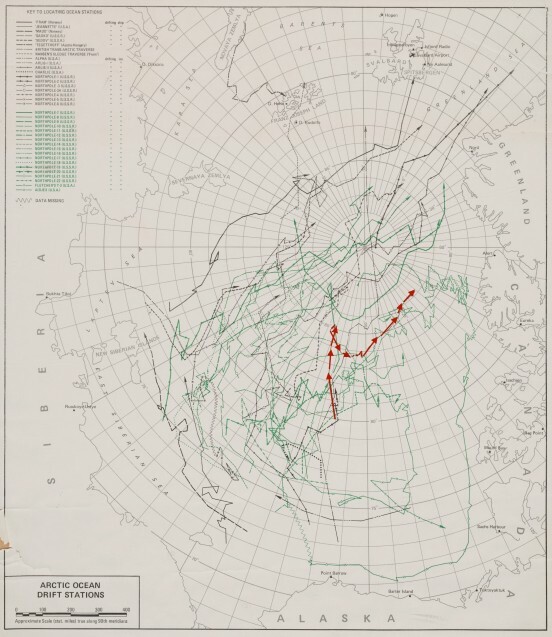 The 18 months of operations tracked the ice floe movement as it shifted ~2,000 miles around the Arctic in a clockwise manner until it was just north of Ellesmere Island, Canada (map below). Somehow, the rigid presence of the Healy seems infinitely more secure than a few tents and rigs set directly on the mile-long by half-mile-wide section of sea ice under station Alpha. Float Your Boat “vessels” were loaded into boxes and shipped to the Healy in advance of the deployment. Tim Kenna, right, with Marty Fleisher at the North Pole. Tim worked with several groups of local students, including Pearl River High School Marine Science Club and his son’s fifth-grade class at Upper Nyack Elementary School in the “Float Your Boat” project for GEOTRACES. We are closing in on a week of intense focus and excitement for GEOTRACES and for the United States around the Arctic. It was barely a week ago (Aug. 31) that President Obama became the first sitting president to visit Alaska, refocusing the other 49 states on the fact that we are indeed an Arctic Nation. 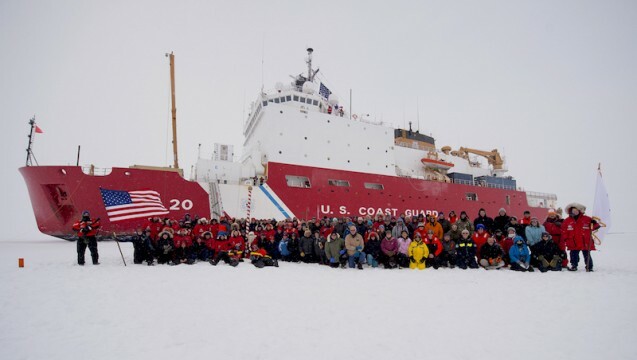 This historic first was followed closely by another, the Sept. 5 arrival of the U.S. Coast Guard Cutter Healy with the U.S. GEOTRACES scientists on board at the North Pole, completing the first U.S. surface vessel transit to the pole unaccompanied by another icebreaker. Combined with this, U.S. GEOTRACES became the first group ever to collect trace metals at the North Pole. You might assume these three items are unrelated, but they are in fact tightly linked. In convening the GLACIER Conference (Global Leadership in the Arctic: Cooperation, Innovation, Engagement & Resilience) in Alaska, President Obama focused on a region that is fast changing due to its fragility and vulnerability to climate change. The meeting timing aligned nicely with the U.S. assuming chairmanship of the Arctic Council, and was a perfect platform for the president to address climate change, an issue that he has tackled aggressively. Conference sessions on the global impacts of Arctic change, how to prepare and adapt to a changing climate, and on improved coordination on Arctic issues all align with the work of Arctic GEOTRACES, although tackled from a different angle. It was while he was in Alaska that President Obama announced a commitment to push ahead the schedule for adding to the U.S. icebreaker fleet. The “fleet” has dwindled to just 3 U.S. vessels at present, and limits our ability to work in the Arctic. The goal of adding another icebreaker by 2020 will help to address this. 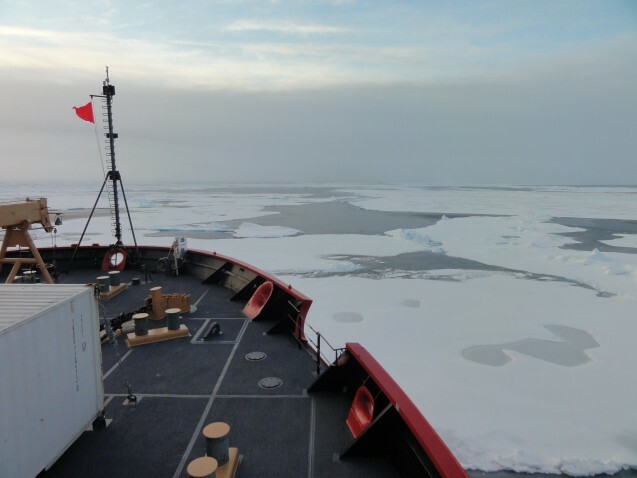 “Working” in the Arctic for this Coast Guard cutter includes supporting the research that is critical to our being able to develop a baseline understanding of conditions and more accurately predict the future changes. Evidence for change in the Arctic is found in the ability of the U.S. Coast Guard Cutter Healy to cross the Arctic ocean along its longest axis (the Bering Strait route) and penetrate deep into the sea ice to make it to the North Pole unaccompanied. The ice has been thinner than expected and experiencing a much higher degree of melt. 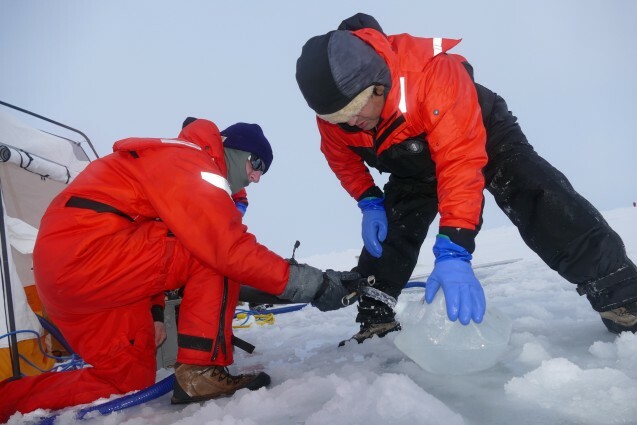 Ice stations, where the science team gets out onto the ice to sample, have been postponed because of safety concerns from the thin ice conditions. Everyone, including the captain, has been surprised by the conditions. The thin ice has increased the speed of travel. 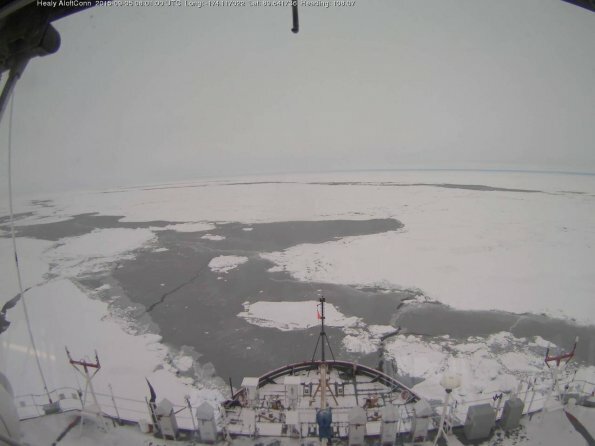 Although some thick (up to 10 feet) and solid ice has been encountered, much of the cruise has been spent traveling at up to 6 knots, and much less fuel has been used than expected because of this. The last week has been action packed for all 145 people on the Healy. First. a “superstation” was run, a 57-hour sampling stop with a large number of samples collected in the ~4,000-meter-deep water. A super station includes additional hydrocasts and pump sampling for the groups like Tim Kenna’s, that require large volumes of sample water. This was also a crossover station with the German GEOTRACES cruise on the Polarstern. Crossover means some of the extra samples collected can be used to do intercalibration (check to see that the results compare) between the science teams on the two ships. The German ship will collect at the exact same location. With large sampling projects using multiple labs and sampling teams, intercalibration becomes extremely important for interpreting the results. After our long superstation, the team went almost immediately into a dirty-ice station (ice that entrains sediment as it freezes). This ice can form in several ways: during the spring thaw when ice dams in Arctic streams force sedimented water out onto the ice, where it refreezes; during cold storms that churn up sediments in the shallow shelf regions to refreeze on the surface ice; and when shallow areas freeze solid, collecting sediment at the base, and later break away. Once the ice is formed, it moves into the Arctic circulation pattern, so identifying the source of the sediment can help us better understand the temporal and spatial nature of Arctic circulation. 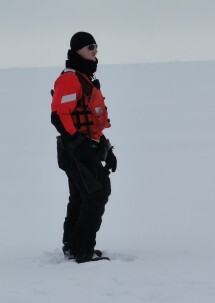 This type of ice has high value for Tim’s research, since short-lived radioactive isotopes are frozen into the ice with the sediments, providing a timer for the formation of the ice. The dirty ice station was followed by an ice-algae station. Both of these entail stopping the ship and craning over two people in a “man-basket” where they can get out and sample (see image). This was followed closely by two full ice stations, where many groups went out on the ice to do their sampling; some for over 12 hours (brr). The second ice station had wind chills of -14 C.
Field time, especially in the polar regions, is expensive and limited, so while in the field it is critical to complete as much science as possible. Sleep happens later when the team is back home. Lamont Note: As part of the Healy’s instrument package, they standardly carry a CO2 instrument from Lamont’s Taro Takahashi. This was onboard when the Healy reached the North Pole (89.997 °N). The partial pressure of CO2 (pCO2) in seawater was found to be 343.3 micro-atmospheres at the water temperature of -1.438 °C. This is about 50 micro-atmospheres below the atmospheric pCO2 of 392.7 micro-atmospheres, and indicates that the Arctic Ocean water is rapidly absorbing CO2 from the air. The measurements confirm that the Arctic Ocean is helping to slow down the accumulation of the green house gas in air and hence the climate warming. Sediment coring the bottom of the world’s oceans is something that Lamont knows a lot about. Since 1947 Lamont has been actively collecting and archiving sediment from around the world. 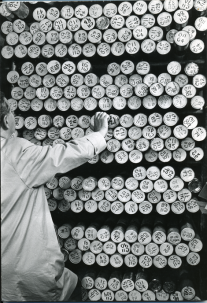 Currently our Core Repository contains sediment cores from every major ocean and sea in the world, some 18,700 cores. This is in large part due to Lamont’s first director, Maurice Ewing, who instilled a philosophy of “a core a day” for all ocean research vessels. Ewing firmly believing that if we had the sediment, we would be able to piece together patterns and stories about our planet, so every day at noon, or thereabouts, the ship would collect a core. Scientists from around the world have requested slivers of mud from the cores in the repository to unlock Earth’s mysteries and secrets. The cores in Lamont’s Core Repository are no stranger to revealing stories of Earth systems, including those of climate cycles. Almost 40 years have passed since the groundbreaking work of the CLIMAP group that used the cores to connect the start of Earth’s glacial cycles to changes in eccentricity, precession and tilt. (Hayes, Imbrie and Shackleton, 1976) . 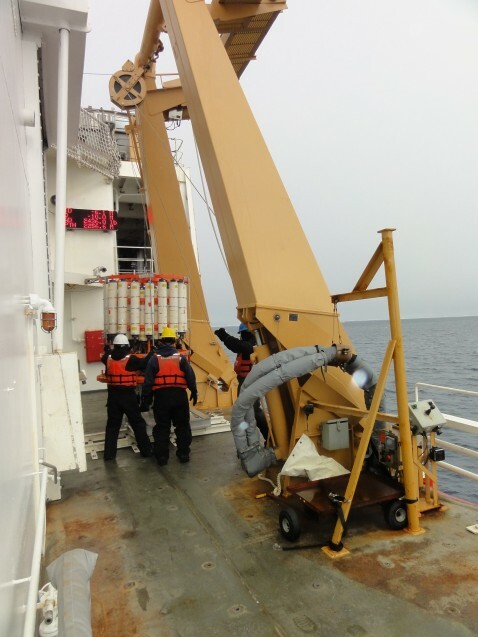 Collecting sediment on this Arctic GEOTRACES cruise will help us understand more of the stories locked in the oceans. The length of a core is dictated by the goal of the collection. Early Lamont cores were more about collecting just to gather the material because the ship was there. These early cores were generally 6 to 9 meters long, although one incredibly long 28.2m core was collected from the Central Pacific. 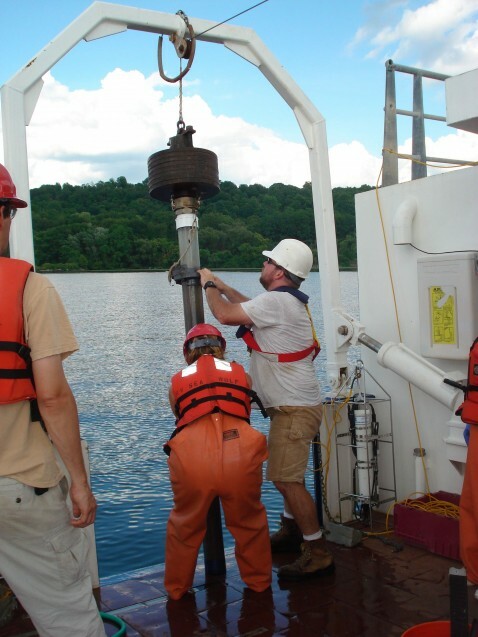 Locally cores have been collected on the Hudson River and local marshes that are closer to 1 or 2 meters in length. 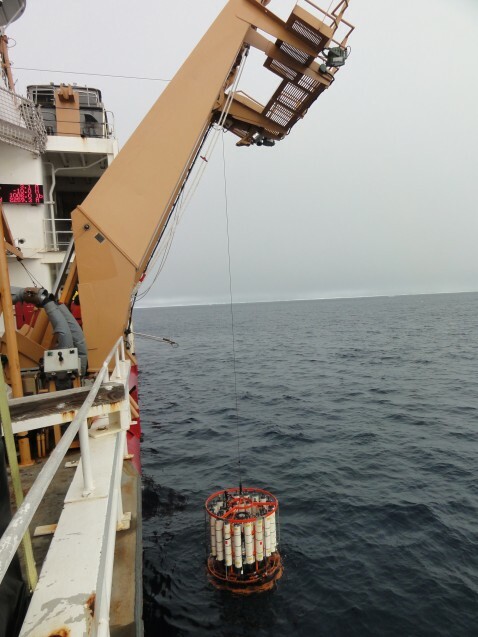 For the sampling GEOTRACES is doing in the Arctic, there is a specific goal of collecting just the top few dozen centimeters of sediment and the water just above it, yet at a depth of ~2,200 meters. This will require a much different technique than what was used for the Central Pacific core. 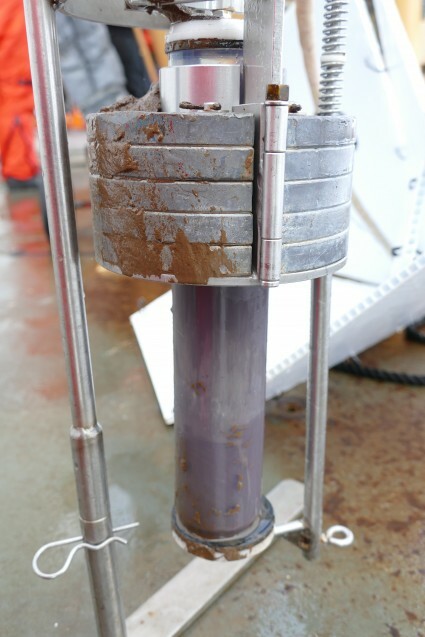 The sediment in this region is soft, so the plan was to drop a small, general-purpose device called a mono-corer over the side of the ship with a few small weights on top to help drive the core tube in straight. The corer would hang below the bottom of the rosette of water samplers, far enough below that the rosette would remain mud-free but still able to collect near-bottom water samples. The mud in the mono-corer would be held in place by a spring-loaded door that snapped closed once the mud was inside and the tube began its return trip to the ship. All sounded good. Now to unpack its secrets. Sounds like the basis for a great scifi thriller… “scientists scour Arctic, hunting for traces of nuclear fallout and ejections from cosmic ray impacts.” In reality this thriller theme is the actual core of the GEOTRACES mission. Let’s break it apart a bit to better understand it. The project Tim is focused on is the human introduced (anthropogenic) radionuclides that are released into the environment as a result of nuclear industrial activities, things like weapons production and testing, as well as nuclear power generation and fuel reprocessing. This includes isotopes of plutonium, neptunium, cesium, strontium, iodine and uranium that are not normally found in the environment. The major sources of these nuclides include fallout from atmospheric weapons testing and liquid releases from European nuclear fuel reprocessing. One goal of our project is to determine the budgets (overall input and export) of these contaminants. Samples collected along our cruise track combined with those collected on the European GEOTRACES cruise taking place on the Polarstern will allow us to do this. We are also collecting samples to evaluate for the presence and distribution of contamination related to Fukushima. Two cesium isotopes were released into the environment as a result of Fukushima; Cesium 137, with a half-life of 30 years, and Cesium 134, with a much shorter half life of two years, so little is left from past nuclear testing. Fallout from Fukushima is an excellent tracer to help us learn more about ocean circulation and transport models. Another part of the GEOTRACES team is measuring Beryllium-7 (Be-7), a cosmogenic nuclide that is created when a cosmic ray breaks apart heavier atoms into smaller atoms. Be-7 is a short-lived isotope with a half-life of 53 days. We can use this short half-life to tell us something about water circulation and exchange rates under the ice. 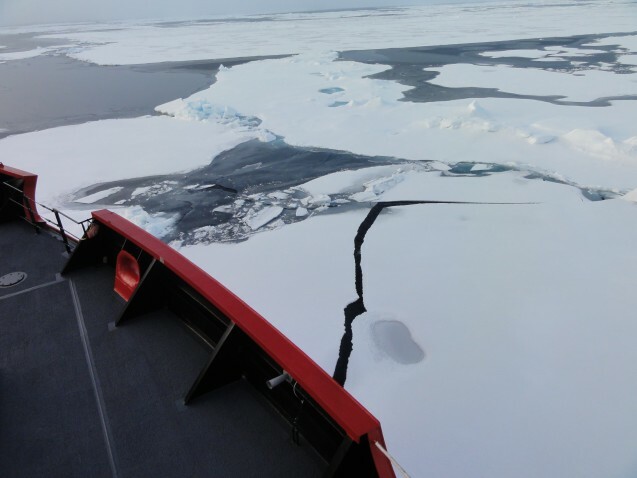 Currently the team is measuring Be-7 in the marginal ice zone. 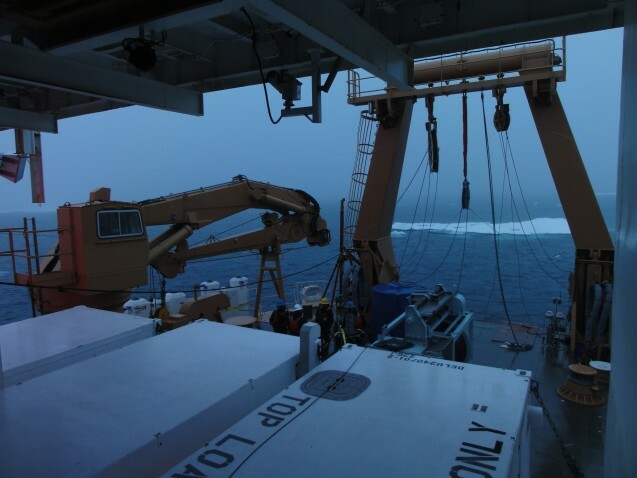 Once the ship reaches a section of ice that is large and thick enough for the scientists to work on, we will drill through to measure under the ice as well. Yes We Have a Bubble Room! When we said “trace” elements we weren’t kidding! 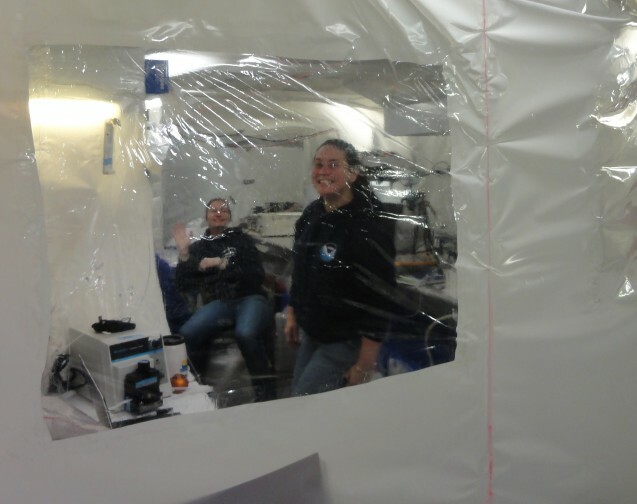 Jess and Sara are part of the team working on contamination-prone trace elements. Their work is done in an inflatable bubble to keep it ultra clean. The bubble is inflated using high-efficiency particulate arresting (HEPA) filtered blowers. Trying to measure very small trace elements without contamination is extremely difficult, and it is a testament to their skills that they can measure elements such as zinc and iron, which are extremely low in seawater but very common on the ship (rust never sleeps!). Getting an accurate measure means not picking up any of that ship input. In order to run all these great experiments, we need samples, so we are collecting and filtering water at as many stations as we can. 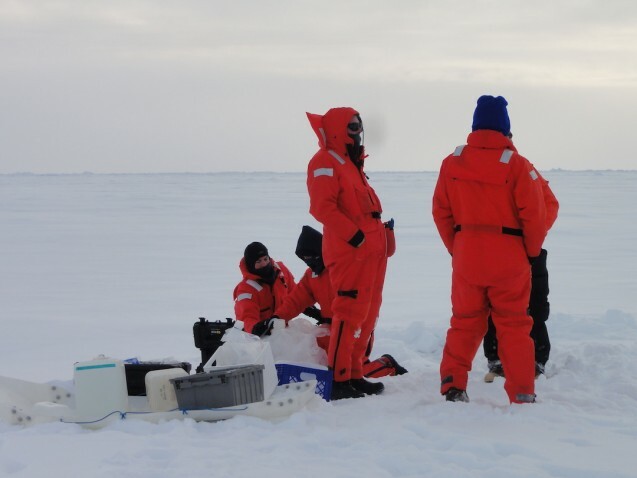 Sampling in the ice pack is very different than sampling in an open ocean. Station locations must be very carefully selected to reduce the risks of the equipment getting entangled in the ice and ending up either crushed or ripped away. Even in less dense ice, we caught the hydrowire on an ice floe (above). 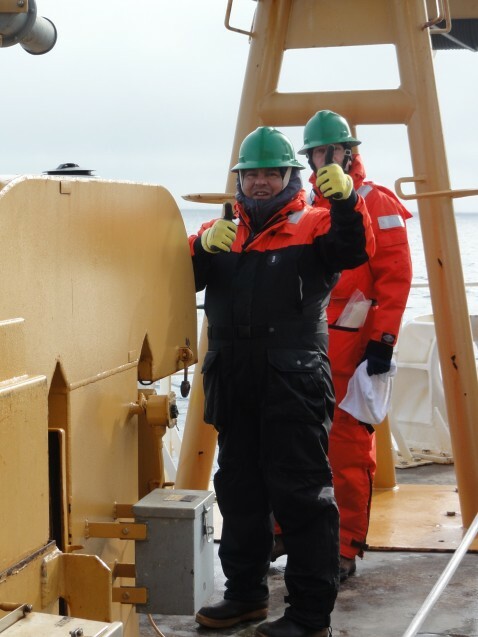 Everything is supersized on a ship like the Healy, from the large metal A-frame support that is used to lower collection equipment (yellow/buff colored) to the circular metal rosette which is filled with niskin collection bottles for gathering water samples. 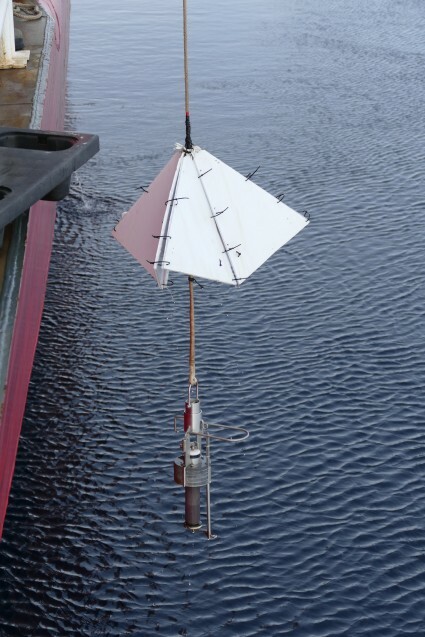 The deployment of a rosette for sampling is called a “hydrocast.” This allow scientists to collect water at a variety of depths. 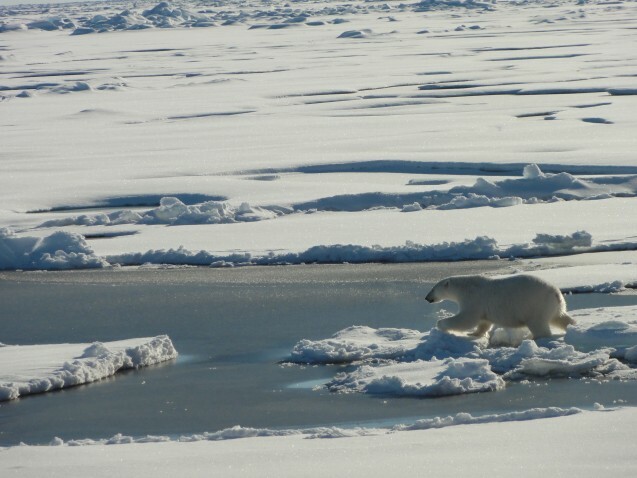 The images below are from a few days ago, before we hit denser pack ice. The rosettes can hold up to 36 bottles. Each bottle can be programmed to snap closed at a specific depth, so in one deployment, water can be collected at up to 36 different depths. This is extremely valuable for teasing apart circulation through tracking small particles entrained in the water column at different depths. The water collected in these sampling bottles will be used for a range of studies. This sequence of the retrieval of this hydrocast involves four people to collect and stabilize the rosette, as well as the personnel up above operating the winch to lower the equipment, and several people in a console monitor verifying both the depth of the rosette and that the cable on the equipment is sending up the necessary data. Operating the equipment on a ship is labor intensive, but each deployment retrieves enough sample material for not only the team on board the Healy, but for colleagues and partners waiting back at their home institutions for samples. The position of the research vessel Coast Guard cutter Healy on Aug. 24, 2015. The oval shaped blue area in the map above is the basin of the Arctic Ocean, ranging from ~3,500 meters to ~5,000 meters at its deepest. The Healy is currently over a ridgeline named the Mendeleev Ridge, after a Russian chemist and inventor, Dmitri Mendeleev, long dead when the ridge was first discovered by fellow Soviets in 1948. Mendeleev Ridge is about 1,000 meters shallower than the deep Arctic, bottoming out at ~2,500 meters in depth. The Russians maintain that the ridge, with its long reach into the Arctic basin, gives them claim to large sections of the ocean stretching out to the North Pole. The claim remains unresolved, in part because there are so many questions that still remain about the Arctic. 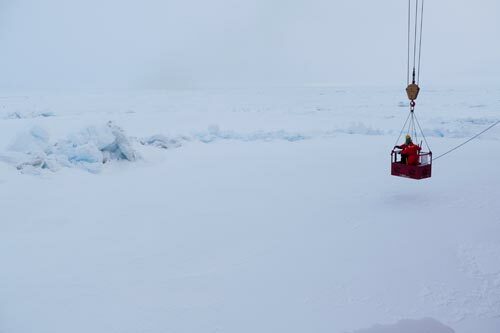 As we move into the basin, we will be sampling to try and better constrain what happens at the shelf/basin interface. 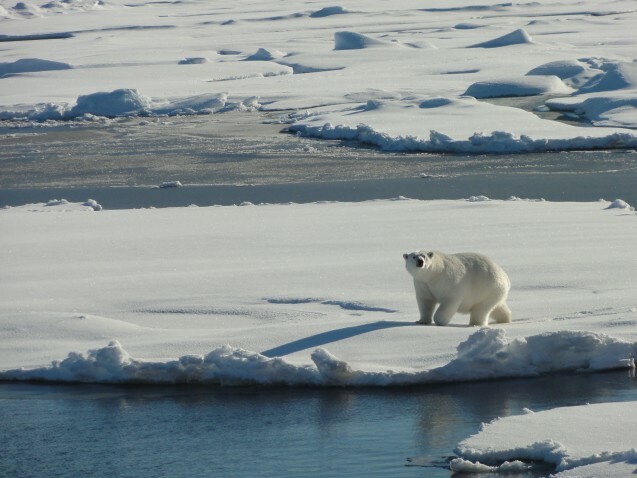 When we venture into the Arctic for research, for most of us there is the lingering hope that a polar bear will appear on our watch; at least as long as we are safely outside of its reach. 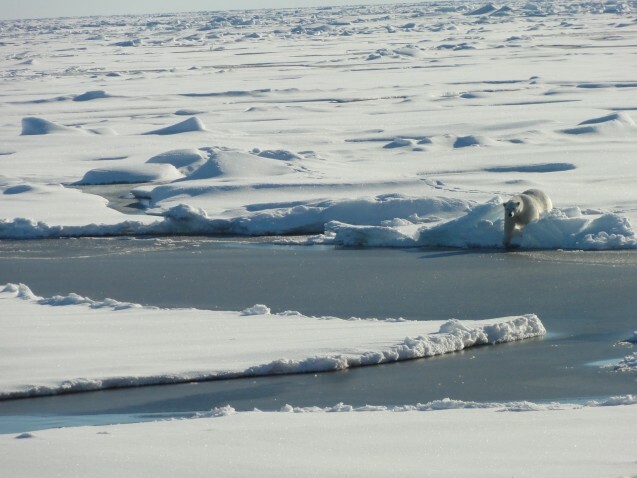 Several polar bear have been spotted by the watchful eyes of the crew as we have moved into the more tightly packed heavy ice away from the marginal ice zone. 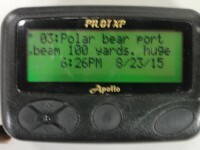 However, today a very large bear (yes the alert text says “huge”!) was spotted, and it seemed to have us under thoughtful consideration. 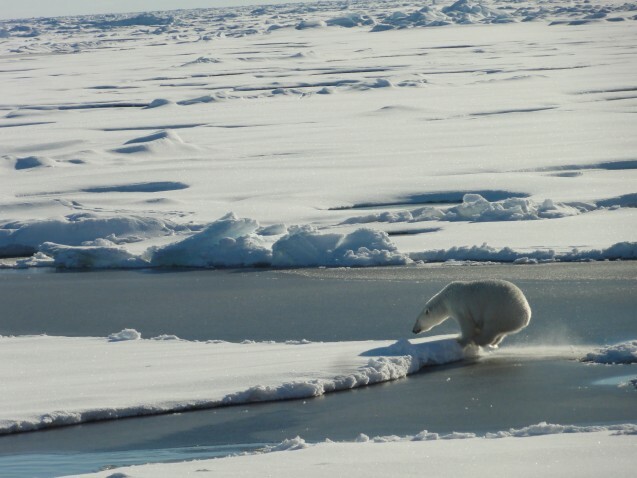 The following is a string of images that relay the majesty of this incredible creature in its natural environment, moving with great agility over the sea ice. 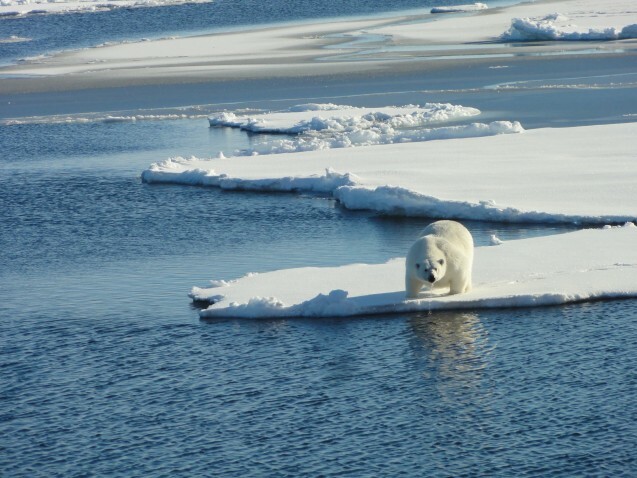 Polar bear live only in the Arctic and rely almost entirely on the marine sea ice environment for their survival. They use the ice in every part of their daily life, for travel, for hunting ringed seal, their favorite food, for breeding and in some cases for locating a birthing den. 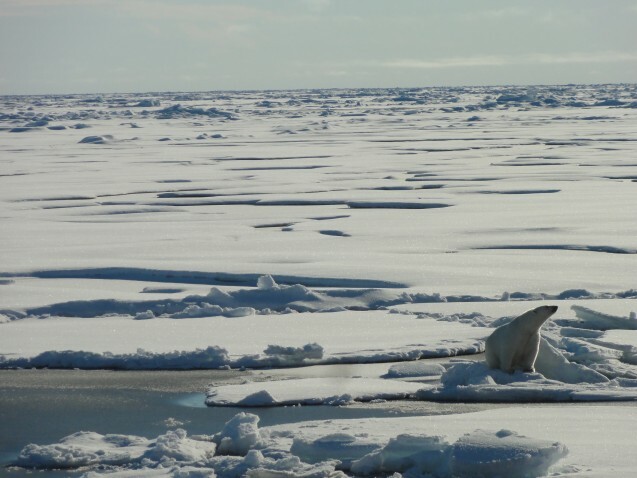 Their wide paws, which you might be able to see in these photos, distribute their weight when they walk on the sea ice, which late in the season can be quite thin in the annual ice region, melting down to only a thin crust over the water. Their large size, clearly visible in these photos, belies the fact that they are excellent swimmers, helped by their hollow fur, which traps air to keep them buoyant, as well as the stiff hair and webbing on their feet. For all their cuddly appearance, they are strong hunters. 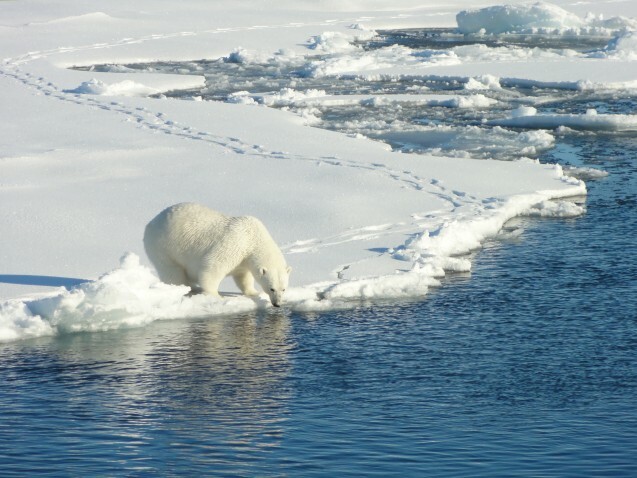 Currently polar bear range in conservation status from Vulnerable internationally, to Threatened in the U.S., primarily the result of a warming climate that is melting their habitat…sea ice. The Arctic is approaching the annual low for sea ice extent, which occurs each year in September. An image of sea ice extent for today (shown in white) against an average of the last thirty years (outlines in yellow) shows how our annual sea ice cover has dropped. Today’s cover is 2.24 million square miles (5.79 million square kms), which is 521,200 sq. miles (1.35 million square kms) below the last 30 year average period. Aside from being of concern to the polar bear, this is part of why Arctic GEOTRACES is so important. We need to understand the role of sea ice in current circulation patterns and delivery of trace elements and isotopes in the Arctic, and then bring this more complete understanding forward to our careful examination of the changing Arctic. Tim Kenna captures himself in the field surrounded by Arctic sea ice. 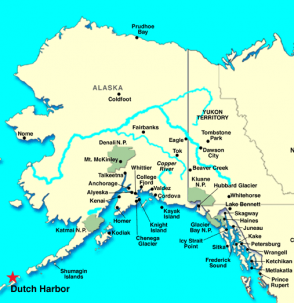 Dutch Harbor Alaska is located on that long spit of land that forms the Aleutian Islands of Western Alaska. 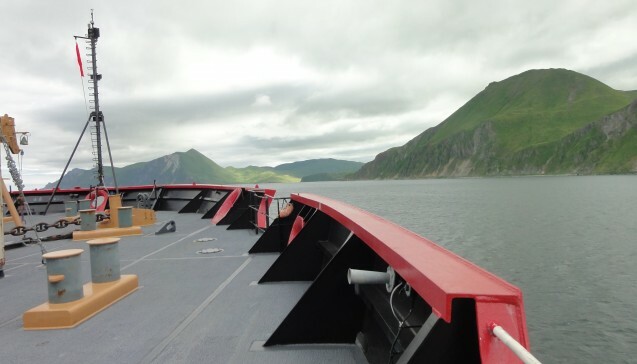 Research vessels launch from this location and head northeast into the Bering Sea on their way to the Bering Strait, the gateway to the Arctic. What is GEOTRACES studying? The program goal is to improve our understanding of ocean chemistry through sampling different trace elements in the ocean waters. Trace elements can be an asset or a liability in the marine system, providing either essential nutrients for biologic productivity, or toxic inputs to a rapidly warming system. This part of the larger program is focused on the Arctic Ocean, the smallest and shallowest of the world’s oceans and the most under siege from climate change. Results from this cruise will contribute to our understanding of the processes at work in the Arctic Ocean, providing both a baseline of contaminants for future comparisons as well as insights into what might be in store for our future. The land surrounding the Arctic Ocean is like a set of cradling arms, holding the ocean and the sea ice in a circular grasp. Within that cradle is a unique mix of waters, including freshwater from melting glacial ice and large rivers, and a salty mix of relatively warm Atlantic water and cooler Pacific water. Our first sample station lasts over 24 hours and focuses on characterizing the chemistry of the water flowing into the Arctic from the Pacific Ocean. This is critical for locking down the fluxes and totals of numerous elements in the Arctic. Daily map from the ship showing sea ice cover. Yellow is the marginal ice, and the red is heavy ice. The location of the Healy is visible at the lower edge of the photo at the edge of the red dot. In the past the “embrace” of the Arctic land has served as a barrier, holding in the sea ice, which is an important feature in the Arctic ecosystem. In 2007, however, winds drove large blocks of sea ice down the Fram Stait and out of Arctic. In recent years the Arctic sea ice has suffered additional decline, focusing new attention on the resource potential of this ocean. 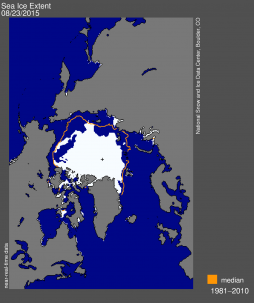 Unexpectedly this year, the sea ice is projected to be thick along the proposed cruise track, thick enough that it might cause the ship to adjust her sampling plan. The walrus in the above image are taking advantage of the Arctic sea ice. 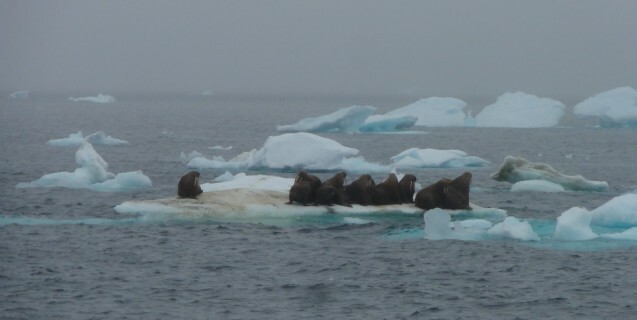 Walrus use the ice to haul out of the water, rest and float to new locations for foraging. Walrus food of preference is mollusks, and they need a lot of them to keep themselves satisfied, eating up to 5,000 a day, using the sea ice as a diving platform. As the ship moves further from shore, we will lose their company.